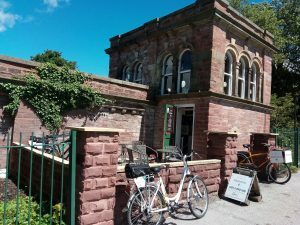 BikeStation – the bike hub and café at Ulverston Station. Jon and Caroline Clutterbuck provide a full range of bike services, Sales, Service, Repairs, and Hire, as well as a friendly, easy-going café, where commuters using the station can get a quality coffee, tea, hot chocolate, and enjoy our relaxed hospitality. With high quality coffee and tea from Lancaster’s own blenders and roasters, Atkinson’s, and genuine Belgian hot chocolate from importers, Choc-o-lait, we are committed to serving only the best products, sourced locally where possible. Hot drinks to take away if you have a train to catch, along with a good selection of food & snacks. Seasonally we offer soup or ice creams! otherwise toasties & sandwiches and traybakes. On the bike side of things, Jon was a self-employed mobile bike mechanic for seven years prior to opening BikeStation, and a bike nut for many years before that! His well-equipped workshop is ready to deal with just about any bike-related work, from gear and brake adjustments to full frame and bike builds. We are mobile, we can come to you as well. We cover the areas of Ulverston, Dalton, Barrow, Askam, Kirkby (the Furness peninsulas), Grange, Flookburgh, Newby Bridge and Windermere.